Wheel/rail interaction is complex, variable and difficult to manage — especially on rail transit systems where noise, vibration and ride quality present daily challenges. As a result, managing the wheel/rail interface requires constant attention and innovation. Speakers at Advanced Rail Management’s Rail Transit 2010 seminar on Wheel/Rail Interaction examined issues such as noise and vibration, corrugation and wheel/rail profile design, among others, that new and existing systems must face. A “healthy” wheel/rail interface is fundamental to operating and maintaining an effective rail transit system. Its design requires careful consideration of several parameters to ensure satisfactory performance throughout the life of a system. “Time spent optimizing the entire wheel/rail system will more than pay for itself with reduced overall life cycle costs,” said Rob Caldwell, senior engineer in the Rail Division at the National Research Council of Canada’s Centre for Surface Transportation Technology. Unfortunately, the wheel/rail interface rarely gets the attention that it deserves during the design phase of a new system. Poorly matched vehicle/track designs and components lead to challenging (and expensive) problems that typically appear early in the service life of the system. When this occurs, the design/builder is often faced with the hassle and expense of post-engineering a solution in order to begin or maintain revenue service. In other cases, the operator is faced with unexpected maintenance costs several years down the road. Many of the wheel/rail interface issues that can affect new transit systems are now well understood, and can be dealt with in a cost-effective manner during the design phase. Proper pre-engineering of the interface requires a comprehensive understanding of vehicle/track dynamics, however, and the balancing act that managing the numerous forces that are involved represents (see Figure 1). Challenging though managing them may be, the consequences of ignoring the effects of these forces are too great to ignore. Transit systems employ various noise-mitigation technologies with varying degrees of success. Some of these target the source of noise, such as optimizing wheel and rail profiles, suppressing or eliminating corrugation through grinding, and friction management and lubrication. Less ideal methods that may not offer the same cost/noise reduction ratio seek to suppress noise after its generation, like wheel and rail dampers, vehicle skirts, and undercarriage absorption, Saurenman said. Noise generated at the wheel/rail interface can be an issue in underground operations, as well. 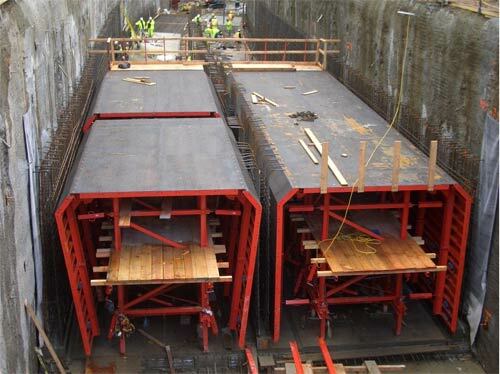 A recent study by SNC-Lavalin measured vibration propagation and attenuation in a 4-km section of a cut-and-cover box structure in close proximity to residential neighborhoods on the Canada Line Rapid Transit Project in Vancouver, BC. As a matter of concern, design specifications necessitated a box structure (see Figure 2), which had a nearly identical resonant frequency to the basement foundations of the surrounding homes. The study used geophones placed inside the basements of adjacent homes and businesses to map the frequency response of each geophysically unique portion of the route. Without proper mitigation, tests indicated that there existed the potential for extensive ground-borne sound and vibration to impact nearby residences. The track structure and wheel/rail interface were therefore optimized to reduce or isolate and attenuate the frequency ranges capable of propagating to the surrounding structures, said Jadranka Talic, Vice President, Rail Systems for SNC-Lavalin Inc. Noise and vibration measurements recorded during the testing and commissioning phase, as well as during the first nine months of revenue service, indicated that the desired attenuation targets were met. Noise is not the only issue facing light rail transit (LRT) systems. Ride quality, safety, and wheel and rail wear are ongoing concerns. Corrugation contributes to all of them. Short-wavelength corrugation (see Figure 3) has developed in tangent track on several LRT systems within the past few years. The pitch of short-wavelength corrugation is on the order of 0.50 in. (13mm) to 0.88 in. (22mm), and even up to 1 in. (25mm) in some cases, said Bill Moorhead, President of Trammco, LLC. Classic corrugation theory states that railhead corrugations will have a minimum pitch of approximately 1.18 in (30mm), based on the contact mechanics of steel wheel on steel rail, he said. Clearly some other mechanism or mechanisms are at work to produce these very short pitch corrugations, but what are they? • Why does short-wavelength corrugation occur only in tangent track? 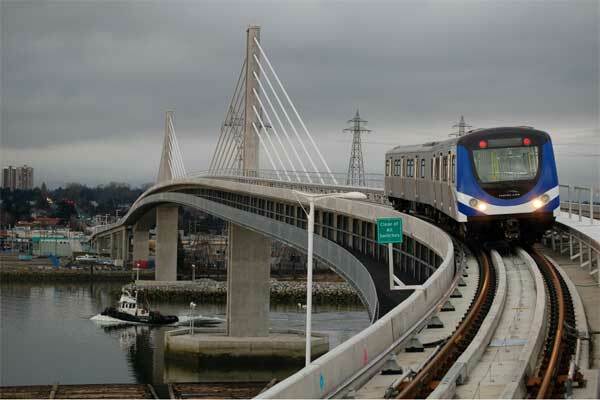 • Is it unique to light rail, or can it also develop on heavy rail systems? 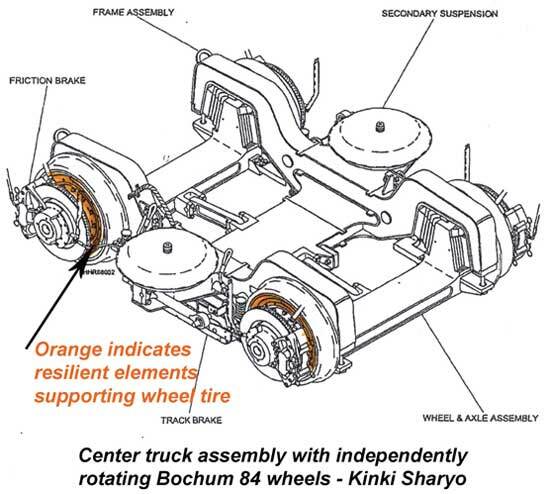 • Could it be caused by low floor LRVs with independently rotating wheels at the center trucks? • Is it somehow related to vehicles with AC-propulsion and/or Bochum-type wheels? • Is it prevalent where traction and braking are at or near adhesion limits? • Is it related to wheel/rail contact geometry and vehicle hunting characteristics? • Does it occur only where railhead grinding has been performed? The investigation is ongoing, with no primary suspects identified at this time. But based on field observations on different properties, it seems clear that the dynamics of resiliently mounted wheels, both powered and independently rotating wheels, warrant additional scrutiny, Moorhead said. High tangential forces near the slip-limit and rail/wheel perturbations may result in wheel/tire micro slip as the resilient element unwinds (see Figure 4). The effects of AC-propulsion synchronization when running mismatched wheel and truck sets also warrants investigation, he said. Until the source of the problem is identified, short-wavelength corrugation will only get worse, and will likely appear on more systems. Track curvature and bogie suspension systems influence not only the shape of worn wheels and rails, but also govern the shape of new wheel and rail profiles that are optimal to a specific mass transit, high-speed or heavy-haul system, Kalousek said. While the magnitude may differ, the forces that cause wheel wear (see Figure 5) on rail transit systems are the same as those occurring on freight systems. And while the damage may appear to be different, it is caused by the same mechanism, he said. 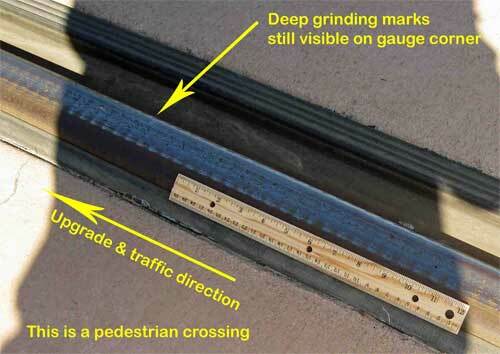 As a result, wear prevention and reduction techniques, like friction management, optimized wheel/rail profiles, rail grinding and other preventive maintenance, are needed on rail transit systems, just as they are on heavy-haul railroads. 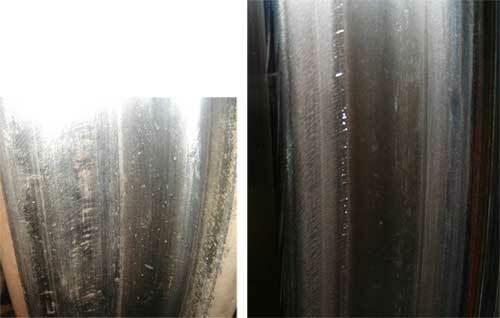 While broken wheel failures are not common in LRT and commuter operation, cracked wheels represent a significant problem in the railway industry, overall, generating an annual maintenance cost of at least $24 million, said David Giragosian, Vice President of Engineering, Dapco Industries, Inc. And the problem continues to grow. Conservative estimates indicate that the number of wheels with cracks grows at 5% more cracks per year; other estimates place the growth rate at 12% to 15%. Internal shattered rim cracks account for 99% of broken wheel failures. The remaining 1% is caused by tread and flange cracks, Giragosian said. Until recently, visual inspection was the only method by which wheel cracks could be detected and evaluated. Thermal cracks too shallow to see often escape detection, allowing a crack to propagate and, potentially, lead to wheel failure. State-of-the-art non-destruction ultrasonic testing techniques now provide a complement to visual inspection, and are able to detect thermal cracks in rolling inspections at 5 mph. Accurate and detailed track measurement is another essential part of effective system maintenance, said Paul Mittermayer, Managing Director of the Bureau of Applied Mechanics and Mathematics. Data collected by track measurement systems typically includes flange radius, rail head, gauge, cant, and corrugations, among others, can be used, not only to find flaws, but to evaluate and model wear over time, and to plan maintenance cycles (see Figure 6). The goal of these and other technologies and maintenance practices addressed at the seminar is to better optimize and maintain the wheel/rail interface.